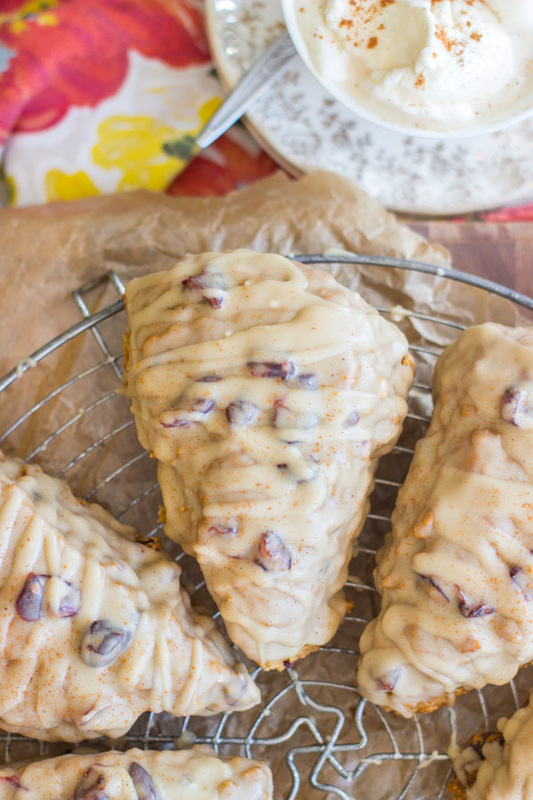 These Gingerbread Cranberry Scones with Brown Sugar Glaze are mandatory for holiday brunch!!! 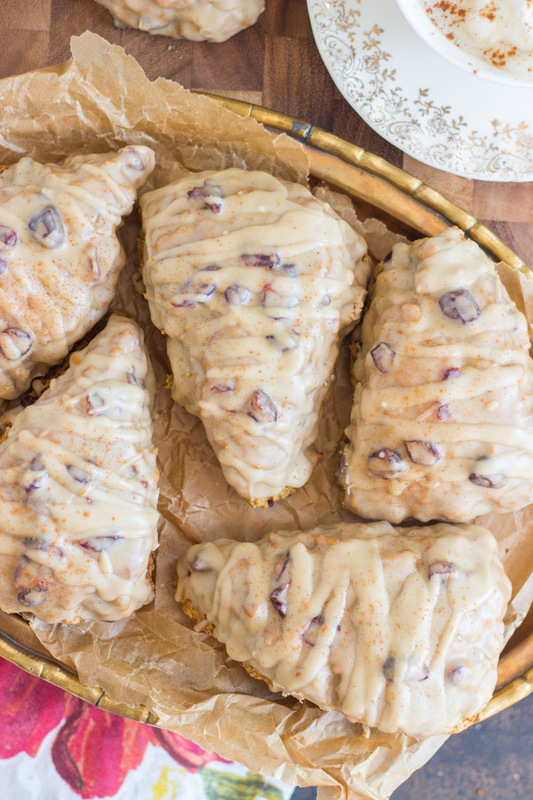 Made with brown sugar, molasses, and lots of holiday spices, packed with tart, fruity cranberries, and that brown sugar glaze on top is killer! I’m watching the Bills game this afternoon and admiring the snowy winter wonderland that’s happening up there. How’s everybody faring in the northeast today? I hope you’re bundled up and cozy in flannel pjs, fleece blankets, and sipping mugs of hot chocolate. Those big, fluffy snowflakes sure look lovely from my tv screen, and I do like to see snow at Christmas when I visit my family in PA. Otherwise, I’m pretty happy that it’s still warm enough here in FL to wear flip-flops. 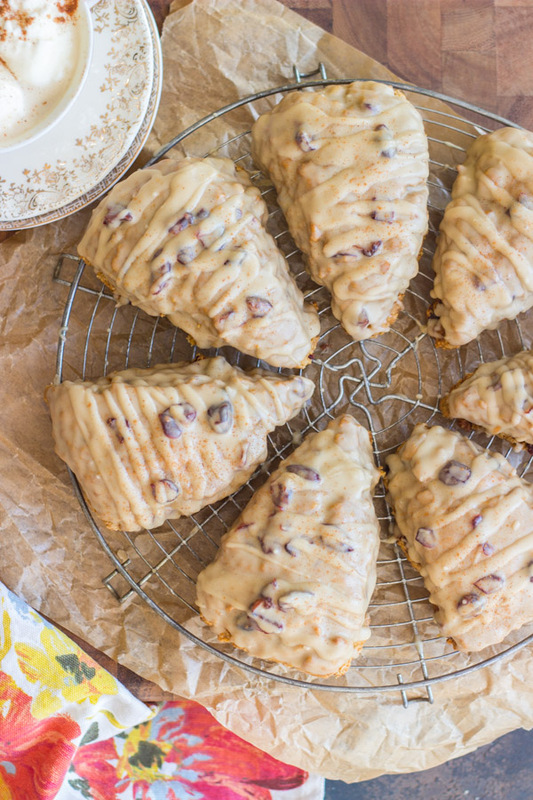 If you’re stuck inside, maybe you can get some holiday baking done! Bake lots of cookies, and stash them in the freezer for two weeks from now. Yes, two weeks! Christmas is in 14 days. I can’t believe it. I felt like I had all sorts of time for weeks, but all of a sudden it’s around the corner, and I don’t feel ready. Funny how it sneaks up like that. I have some serious shopping to do. If you’ve seen any great gift guides this year, point me to them! That’s my day – football, and quality time with Amazon.com to shop for Christmas gifts. Not a bad Sunday. If you need gift ideas for the bakers in your life, by the way, I have a new page, Kitchen Tools, with an Amazon shop. Check it out! Other than football and shopping online, my perfect weekend usually includes an amazing brunch. More often than not, that amazing brunch is scones. But you guys know this! I only talk about it a hundred times a year. 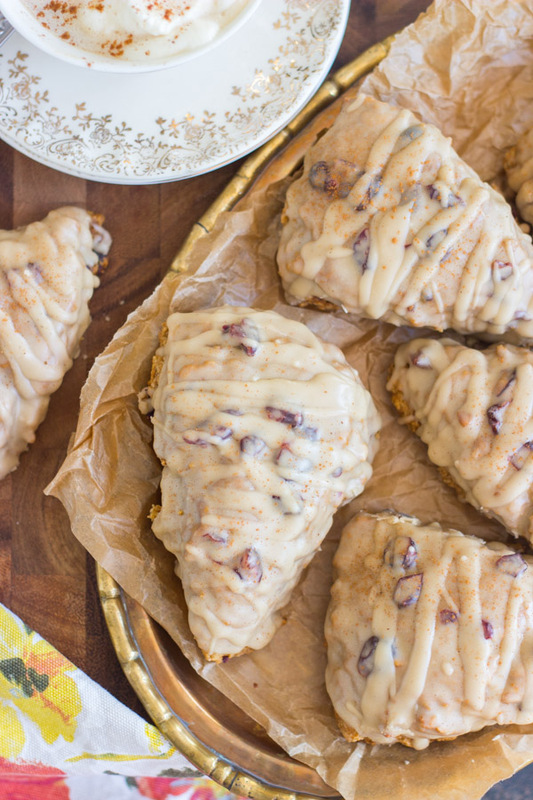 Here’s the latest addition to my scones obsession: Gingerbread Cranberry Scones with Brown Sugar Glaze. 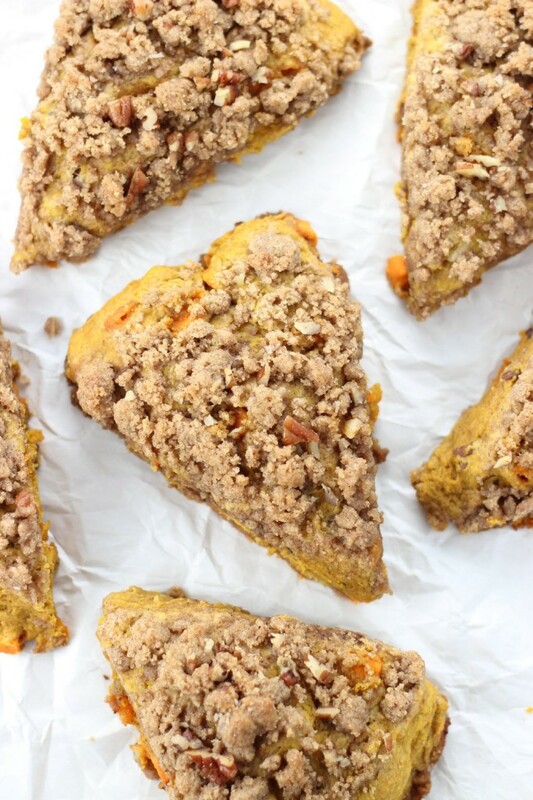 Every component of these scones is awesome. 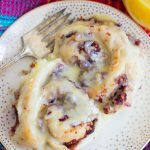 The flavors are amazing, the prep time is pretty short, and you can make these ahead of time to freeze for Christmas day, or whenever you’re hosting guests for the holidays. 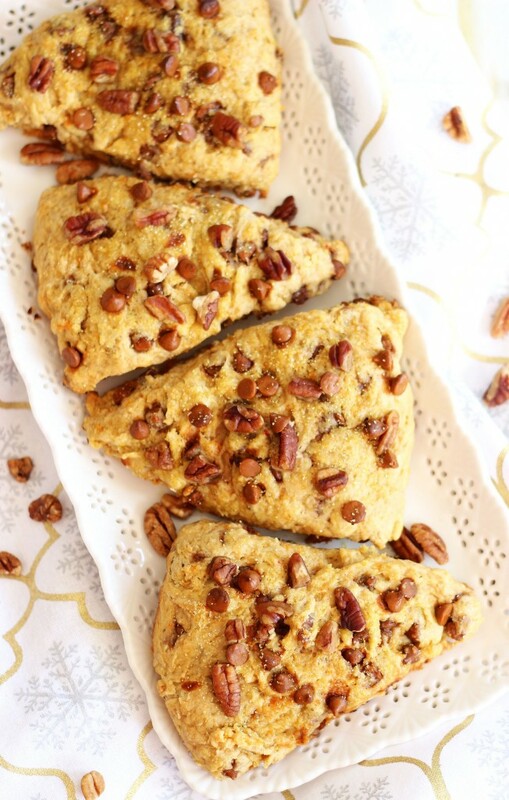 These scones are made with brown sugar, molasses, and a ton of holiday spices, so there is no shortage of ‘gingerbread’ to these. 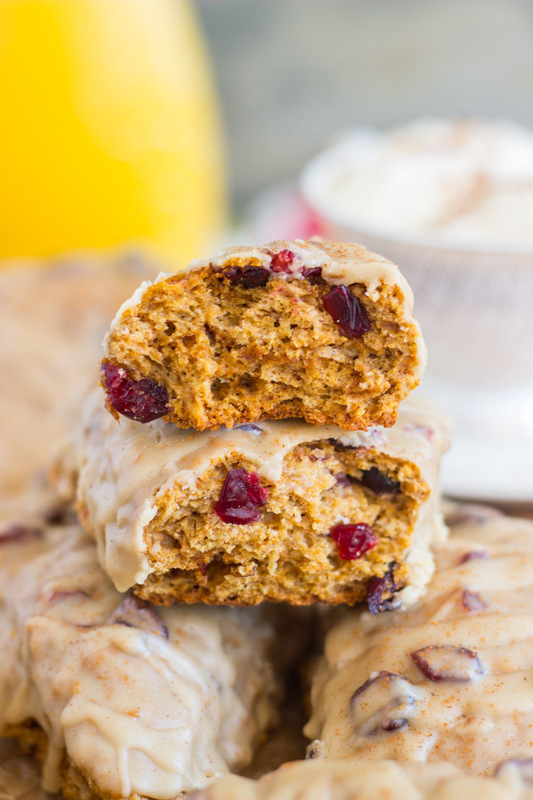 They’re also packed with chewy, sweet-tart, dried cranberries. 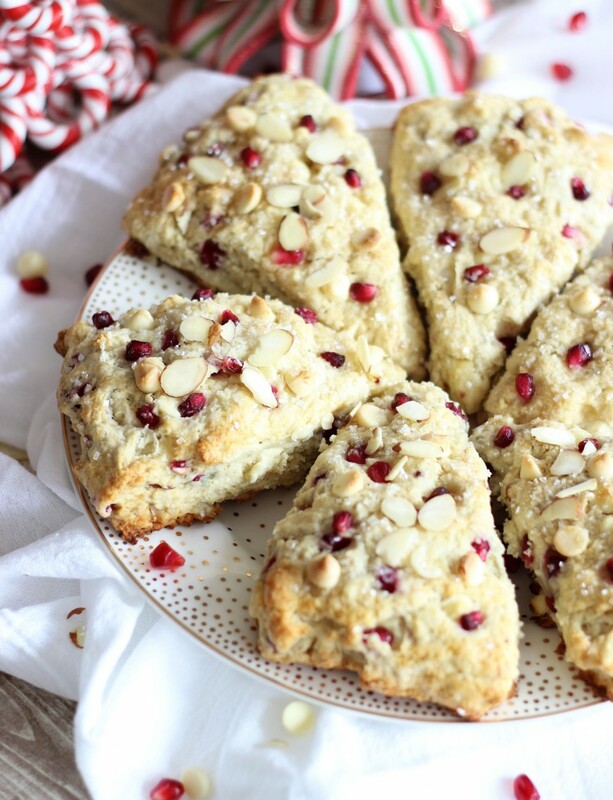 So nice to bite into a moist and flaky scone, loaded with holiday spice, and to find bright, fruity cranberries. The glaze is out-of-this-world. It should be – it’s mostly just brown sugar, butter, and powdered sugar. 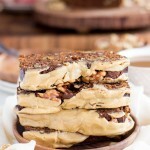 Those simple ingredients are quite magical together, and have awesome written all over them. 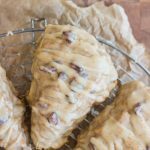 These Gingerbread Scones with Brown Sugar Glaze are easy to make, and are super delicious and festive. Whether you’re just making them for a regular weekend in December, or for Christmas day, make sure they are on the menu. 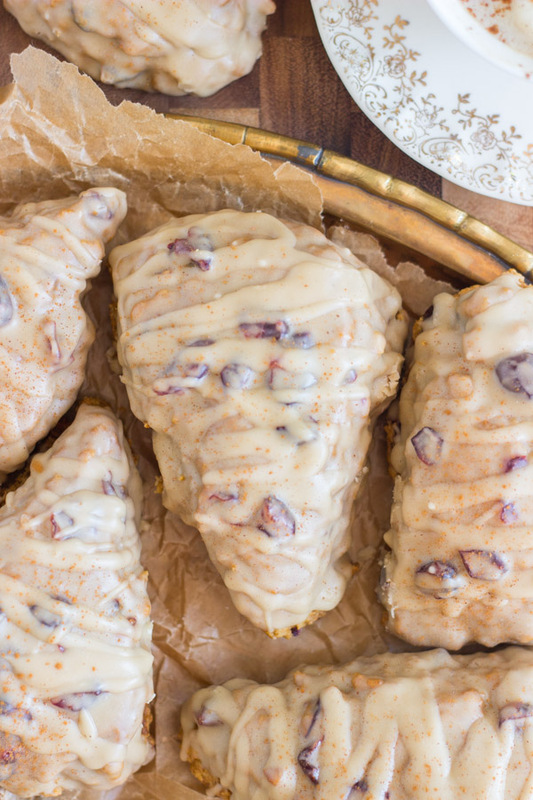 Made with brown sugar, molasses, and lots of holiday spices, packed with tart, fruity cranberries, and that brown sugar glaze on top is killer! 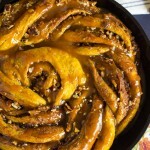 In a large bowl, whisk together flour, brown sugar, baking powder, salt, cinnamon, ginger, and clove. Using a cheese grater, grate in butter, and stir til mixture is crumbly. 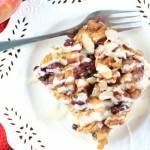 You could alternatively use a pastry blender. In a medium bowl, whisk together eggs, molasses, and heavy cream. Turn dough out onto a lightly floured surface, and knead dough about 5 times, or until it comes together in a ball. Place onto a parchment paper-lined baking sheet, and carefully flatten the ball into a large disk, about 3/4-inch thick. Cut into 8 wedges, and gently pull the wedges slightly apart, about one inch. 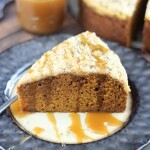 In a small saucepan over medium heat, whisk together brown sugar and water. Cook just until brown sugar is dissolved. Remove from heat, and whisk in butter, salt, and vanilla. Whisk in 1 c. powdered sugar, more as needed, but enough powdered sugar that the scones can be dunked in the glaze, and it won't run right off. 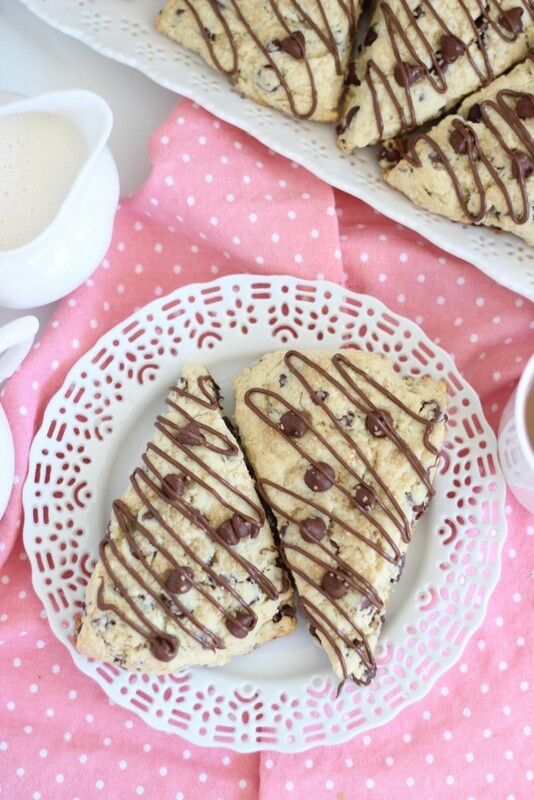 The glaze should be thin enough to dunk the scones, but not too thin that it will drip right off. Dunk the tops of the scones in the glaze, return to the wire rack, and allow 10-15 minutes for glaze to set. 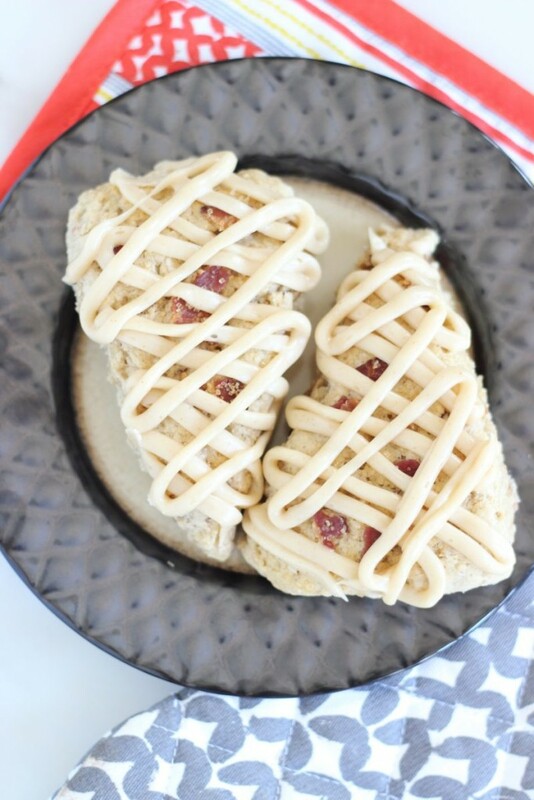 To store and freeze ahead of time, prepare just the scones without the glaze. 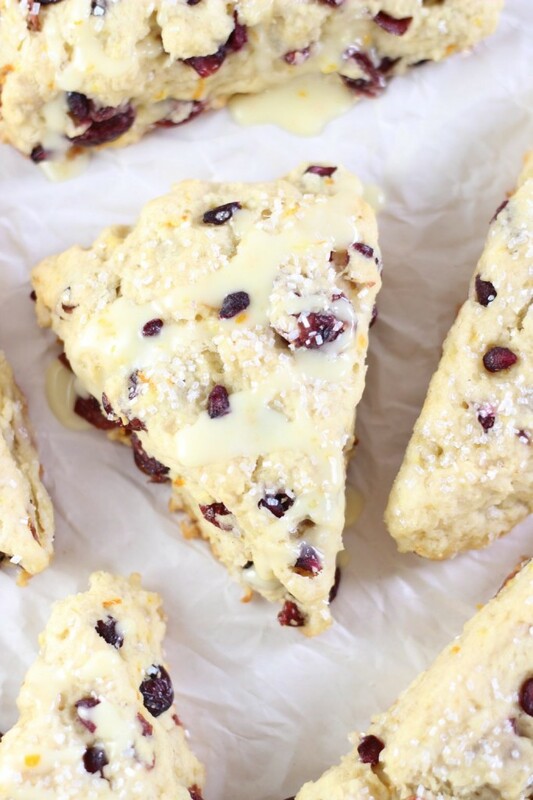 Make and glaze the scones once you've defrosted them and are close to serving them. 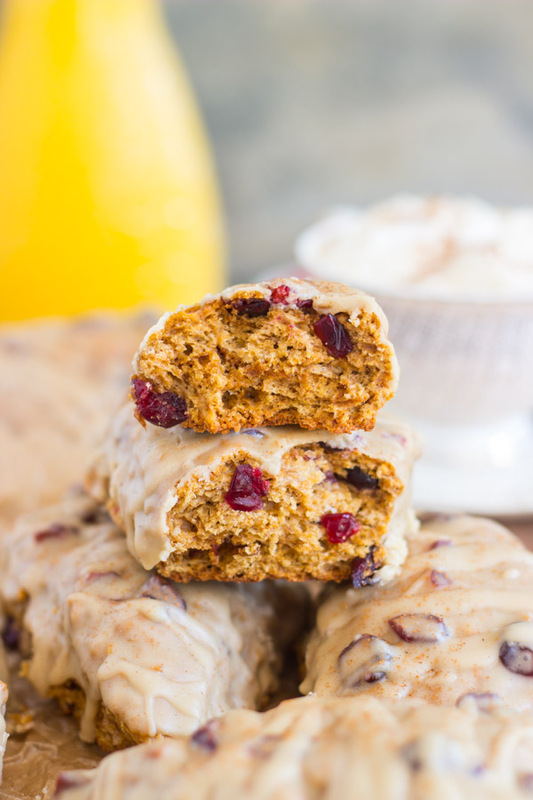 Just a question about the cranberry gingerbread scone recipe. When you say Brown Sugar, do you mean Light or Dark? 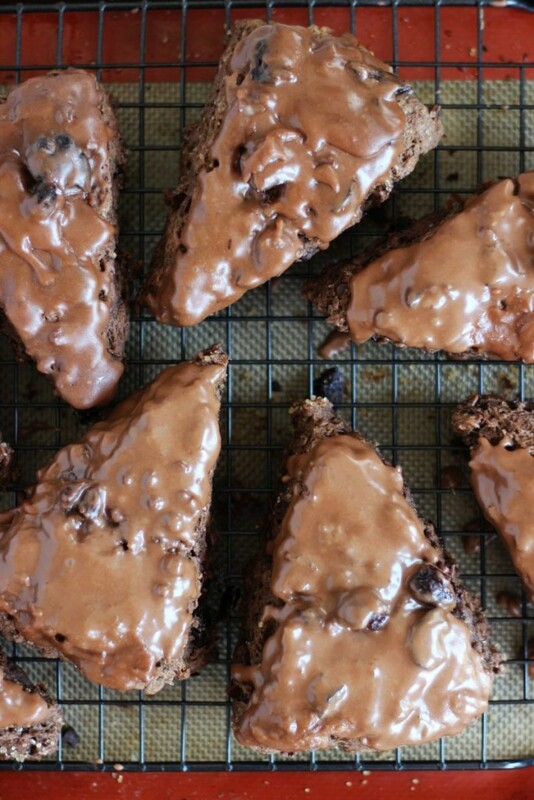 Maybe it doesn’t matter since you are adding molasses to the scone, but what about the glaze?